[0:16] <linguini> I'm running wordpress on my raspberrypi. It seems a bit sluggish (6 seconds from time of click to eventual page load), but the CPU of the pi is far from pegged; perhaps it's fetching files from disk that is slowing it down...? [0:17] <shiftplusone> linguini, using php-apc? [0:18] <linguini> shiftplusone: using apache2; not sure what php-apc is. [0:58] <ShorTie> is that from make or make clean all ?? [1:00] <ShorTie> that is an unusual command, what happens with just make ?? [1:02] <shiftplusone> well, are they there when you open uvcvideo.h in an editor? [2:10] <Tobbi> Hey. I am using raspbmc on my raspberry pi. Does anyone know if I can connect that to a sat receiver? [3:04] <Taylor> What is the point of this cron job executing every 10 minutes? "command -v debian-sa1 > /dev/null && debian-sa1 1 1"
[3:34] <NullMoogleCable> Is there a way to stream a usb webcam using a pi to twitch? [4:19] <rikkib> UG... I finally figured why I could not communicate with a nRF24 from my MC9S08 EVB... The code I was using was controlling the SS pin. [7:23] <SirLagz> has anyone tried the PS2->USB keyboard/mouse converters on the Pi ? [10:02] <cheesenbiscuits> I'd like to know how I can free up some memory on my 256MB raspberry pi as DMESG is telling me that programs I'm trying to run are getting killed due to insufficent memory. [10:05] <Xark> cheesenbiscuits: Not too many things you can do but run less programs or add some swap space. [10:06] <Xark> cheesenbiscuits: Linux will already toss any read-only page (i.e. code page) and get very slow before it resorts to killing processes. [10:08] <ryt0l> would reformatting my sd card and using a new installation of Raspbian give me a new SSH rsa key? [10:08] <Xark> ryt0l: I believe so, yes. [10:26] <Xark> cheesenbiscuits: Adding a swap file might be an OK solution too. [10:26] <Xark> cheesenbiscuits: But it will get slow (and may cause reliability issues on SD card). [10:54] * Xark waves to NSA. Hi! [11:16] <tengri> Hi there. I am having a problem with my raspberry pi (probably sd card slot). It doesn't boot, with a red light on PWR and a small green light on ACT. when I hold the sd card and the board tightly, it boots up but when I stop holding it it gives some EXT4-fs errors and such. How can I fix this? [11:17] <Xark> tengri: Do you have another SD card to test with? [11:18] <tengri> Xark: Sorry, I don't have another SD card. [11:19] <Xark> tengri: Are you fairly sure there is a good image on the SD card? [11:20] <tengri> Xark: Yes, I even tried it with other distros such as Arch Linux. The result is the same. [11:20] <Xark> tengri: Hmm, not sure. Sounds like the RPi doesn't like your SD card. [11:21] <tengri> Xark: I hope so. I'll buy another one soon and see if it works. [11:22] <ryt0l> anyone familiar with mysql? [11:38] <tengri> Xark: WTF. I just glued some paper on top of my sd card and it works. maybe the slot is loose? [11:38] <quench> bent contacts in the slot, dirty SD card? both will do that. [11:48] <gordonDrogon> woo hoo. 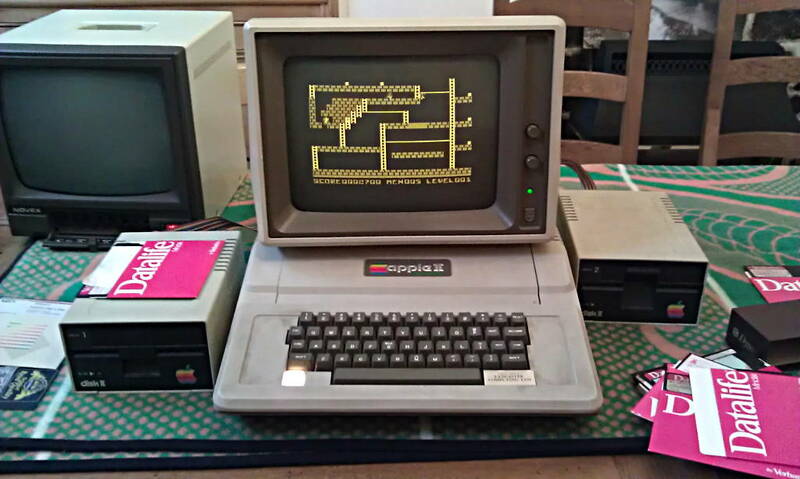 just bought an apple IIc off ebay. [11:52] <gordonDrogon> been looking for a long time for a serial card so I can get my programs off the Apple into something I can use to preserve them longer. [11:52] <gordonDrogon> and I want to translate a few into RTB/FUZE basic too. [11:58] <gordonDrogon> Xark, yes - if I had the code and I couldn't be bothtered to type in the serial code in the big red book. [12:01] <gordonDrogon> I did lots of stuff with the game paddle port. fun days. [12:03] <gordonDrogon> ah, the uk101. I remember those. [12:03] <gordonDrogon> not that popular, but still an intersting kit at the time. [13:06] <[SLB]> anyone got motion work with rpi camera browser? [13:20] <gordonDrogon> Xark, I was plesantly surprised when my 30+ year old box of apple II floppies still read OK.
[15:37] <Nenor> Hello, I have this http://www.pcmag.com/article2/0,2817,2355980,00.asp external harddrive and I tried to connect it to my RasPi. Only thing it did was making "beep beep" sounds. RasPi won't mount it. I tried sudo df and I couldn't see the disk either. [15:39] <quench> Nenor: you can't power it directly from the Pi, it needs a hub inbetween. the Pi can't supply enough power. [15:40] <quench> a powered USB hub, that is. [15:45] <Nenor> Encrypt: quench: Will this http://www.dlink.com/us/en/home-solutions/connect/usb/dub-h4-4-port-usb-2-hub work? [15:47] <Nenor> Encrypt: Is it too much for RasPi? [15:50] <Nenor> Encrypt: This is nice, how much services are you running on it? [15:51] <Nenor> Encrypt: like FTP server, etc. [15:54] <Nenor> Encrypt: Is it too slow? [16:00] <zoso> Hi, I have just installed raspbian, and want to reconfigure tzdata, I get an error saying illegal instruction. What's happening? [16:03] <plugwash> how exactly did you install raspbian? [16:03] <plugwash> have you made any changes to the system? in particular have you made any changes to sources.list or files in sources.list.d? have you attempted to manually install any packages without using apt? [16:05] <a7x> zoso, what did you write exactly? [16:16] <zoso> So how can I install packages like asterisk? [16:16] <a7x> it was missing? [16:18] <zoso> Aah I see. I understand now, do you have pointers to any documentation about building .deb? [16:22] <zoso> See you guys later, got to go. [16:45] <[gnubie]> hi shiftplusone. i'm looking for the raspbian kernel source. [16:46] <[gnubie]> i can't find it. i downloaded the raspbian image from the raspberry pi download site. [16:47] <[gnubie]> sney: i see. thanks. [16:47] <[gnubie]> shiftplusone: thanks. i'll continue from the other channel. [17:14] <Kartog> anyone here got a minute to help me fix an apt-get problem? [17:16] <gordonDrogon> Kartog, not me, but just ask - don't ask to ask... maybe someone will have a solution for you. [17:41] <Kartog> I have a second gateway router in my room routing through the main one. Although, Im connected on my desktop through the same router, so Idk what problem there could be? [17:43] <Kartog> was just trying that, it seems to be working fine? [17:44] <shiftplusone> well, it's the key for the wolfram repo... go figure. [17:44] <shiftplusone> No, I was right the first time, sorry. [17:45] <Kartog> [SLB], is there somewhere I can check to see what keys are listed so i can compare? [17:52] <plugwash> Kartog, that looks sane, what does apt-get update say now? [17:54] <plugwash> what is the corresponding sources.list entry? [17:55] <Kartog> plugwash, Im a complete noob, how do i check that? [17:57] <shiftplusone> looks cromulent to me. [18:00] <shiftplusone> what happened that got you in the current state anyway? [18:01] <shiftplusone> [SLB], are you running from an old install? [18:02] <shiftplusone> [SLB], yeah, it's included in the newer images. [18:04] <shiftplusone> [SLB], got copies and fills? [18:04] <Kartog> plugwash, how would I do that? [18:09] <shiftplusone> [SLB], it's a pretty old addition. Or maybe you installed it and forgot about it. [18:10] <[SLB]> about fbturbo there's something to do or just needed to install it? [18:11] <Kartog> it seems to be having an issue with my router, its showing a link to the 'no DSL connection' page in that output, but every other attempt to connect to something over the net seems to work fine :? [18:16] <Kartog> ah that did it! [18:16] <Kartog> that did it! [18:19] <shiftplusone> eh? what was the fix? [18:21] <Kartog> its a unusual bug, perhaps Ive not configured my router correctly. I set it up yesterday connected to my main router for extra access without covering the house in ethernet cables. [18:51] <shiftplusone> bumbar, got a multimeter? [18:58] <shiftplusone> got a different power supply and a few spare cables? [19:02] <shiftplusone> If the issue is what I think it is, it will just keep happening. [19:04] <bumbar> do you think it's power supply? [19:06] <shiftplusone> Then power might be irrelevant ( or maybe it was a power line fault of some sort ). [19:07] <bumbar> but if it were power supply issue, wouldnt then pi not boot at all? [19:11] <shiftplusone> Well, it would be best to wait until the fault occurs and measure the voltage when it does, rather than wasting money on a new power supply. [19:11] <shiftplusone> But quite frankly, 150 days is a good run. [19:12] <shiftplusone> I would just reboot and forget it. [19:13] <shiftplusone> oh, so it just hangs repeatedly now? [19:13] <shiftplusone> K, I think I'd just be guessing at this point then. [19:15] <ball> Can a Raspberry Pi boot from a USB flash drive or just its SDHC slot? [19:15] <shiftplusone> ah, so it's responding to inputs, but not making it through the boot process. [19:15] <shiftplusone> ball, just sd. You can, however, move the rootfs to USB. [19:15] <shiftplusone> that way, you will only need the card to boot, but the actual OS will run from USB. [19:19] <ball> I've just been to the Raspbian website and now I'm even more confused regarding which image to download. [19:20] <ball> All I really want is an X server, xterm and perhaps openssh. [19:20] <ball> ...oh, and perhaps a simple window manager. [19:20] <shiftplusone> ball, do you care if it comes wit lots of extras preinstalled or would you rather start from a minimal shell-only install and add what you want? [19:21] <ball> shiftplusone: less would be better. [19:22] <shiftplusone> that has the option to install to USB, by the way, so read the readme carefully. [19:25] <ball> This seems a lot more complex than I'd hoped. [19:25] <shiftplusone> Then just dd the foundation's image. [19:25] * ball goes looking for that. [19:27] <ball> When Raspberry Pi distributions say "install", are they talking about installing to free space on the SD card that's past the end of their image? [19:29] <ball> ...perhaps that depends on context. [19:29] <ball> I found the raw image. Thanks for that. [20:05] <gbaman> lets say I have a python script, testScript.py and I want to be able to type into the terminal testScript and it run that script. Does not need root but must be accessible to every user on the system. Suggestions? [20:56] <Futurian> Did you overclock your Pi? Doing so can corrupt the filesystem.. Quickest way to find out if the card is goosed for good is to reimage it. [20:57] <knob> sney, true that! [20:58] <knob> Might save time in the future. [20:58] <Futurian> Just bad luck by the sounds of it.. I'm sure there are better techniques to testing a cards integrity, but reimage can't do any harm if it isn't working currently. [20:59] <knob> Futurian, true that... going to try that now. [21:06] <knob> What do you guys suggest? Try to use it again? [21:06] <knob> Or can I run some kinds of full disk check? [21:13] <Futurian> Surely a good sign.. Don't think chkdsk would be quite as thorough as badblocks. Don't know of a Windows equivelent tbh. You could spend time testing, but I'd just try the install again. [21:13] <Futurian> Full format never a bad idea imo. [21:14] <oldtopman> I can back up spinrite. Worth every cent on HDs, but for a $5 SD card? [21:14] <oldtopman> I've killed so many I just toss em when they start to give me problems. [21:16] <oldtopman> knob: Then send it back under warranty. [21:16] <oldtopman> They are super-easy to kill. If you have mysterious storage bugs and whatnot, just replace it. [21:16] <oldtopman> I've killed a half-dozen micros, a few full size SDs, and if you watch Bunnie Huang's talks on flash storage, you can see that they're total POS. [21:19] <knob> I told my brother the SD card apparently died... and he asked "Made in China?" ... I told him "What isn't?" [21:23] <CDR`> Early models where? [21:49] <marcellus> Hi, I am trying to help my brother who has installed rasplex. We are trying to get a wifi usb dongle to work and there are no /etc/network. Any idea why? [21:51] <oldtopman> justaguy: play, sox, vlc, ffmpeg, or some other way? [21:54] <Taylor> What does this cron job executing every 10 minutes accomplish? "command -v debian-sa1 > /dev/null && debian-sa1 1 1"
[21:55] <oldtopman> What is the command "debian-sa1"? [21:56] <oldtopman> Taylor: Check crontab. [21:56] <oldtopman> See what's going on, maybe there's some comments. [21:57] <oldtopman> It looks like it checks if debian-sa1 exists, then runs it with the options 1 1. [22:34] <marcellus> so no idea why I got no /etc/network ? [22:39] <shiftplusone> It's all a bit too messy for me to digure out what you're doing at a glance, but if I had to guess, I'd say you're missing a & somewhere. [22:41] <shiftplusone> does it die, or does it hold up the boot process? [22:43] <shiftplusone> wehre does 'ifup eth0' come from in the output? [22:45] <shiftplusone> can you run that bit manually and see what happens? [23:07] <skiddex> have just started tutorial on squeak. smalltalk is a very intersting language and surprisingly easy once you get the hang of it.